Prime Minister, the Most Hon Andrew Holness (C) and Tourism Minister, Hon Edmund Bartlett (3rd L) participated in the official ground breaking ceremony for the Closed Harbour Beach project in Montego Bay today. Joining the moment are (L-R) Executive Director of the Tourism Enhancement Fund, Dr. Carey Wallace, Mr. Winston Dear, Chairman Montego Bay Advisory Council, Ms. Heather Pinnock, Acting General Manager of the UDC, Attorney General Mrs. Marlene Malahoo Forte, Senator Ransford Braham, Chairman of the UDC, Hon Godfrey Dyer, Chairman of the TEF, Hon Dr. Horace Chang, Minister of National Security and Hon Olivia Grange, Minister of Culture, Gender, Entertainment and Sport. Closed Harbour Beach Park will include the creation of a beach futsal and multipurpose court, basketball and netball courts, kids play area, food kiosks and outdoor dining area as well as a waterfront rehabilitation component. 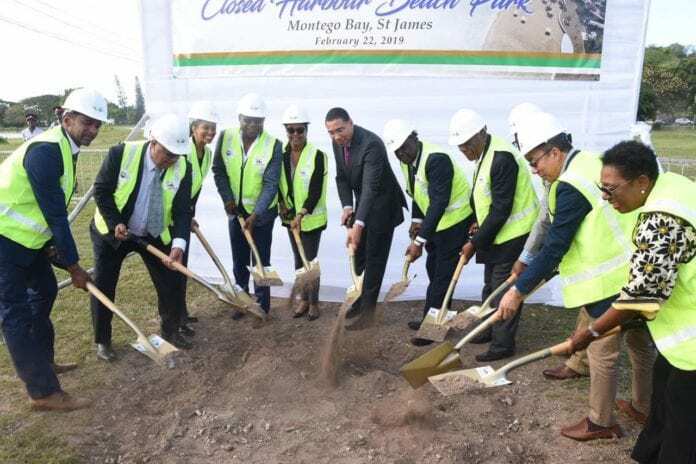 Construction of the highly anticipated Closed Harbour Beach Park in Montego Bay will begin following the official groundbreaking by Prime Minister, the Most Hon Andrew Holness yesterday. The project, which is being primarily funded by the Tourism Enhancement Fund (TEF) and executed by the Urban Development Corporation (UDC), will be the largest transformative development for the parish and largest of its kind in the Caribbean. Closed Harbour Beach Park is estimated to cost J$1.296Billion and will include extensive work to create a beach futsal and multipurpose court, basketball and netball courts, kids play area, food kiosks and outdoor dining area. The UDC will act as project managers for the project which will also see a waterfront rehabilitation component. This will include rehabilitating the groynes that were created in the 1970s that have since been eroded.